We carry products by manufacturer’s based throughout the World. 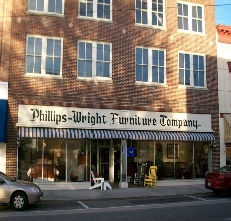 Most of our upholstered furniture (sofas, sectionals, chairs, recliners) is made in North Carolina. We have Solid wood bedroom and dining room furniture made of Solid Cherry, Oak, Maple, Walnut Hickory and Pine. We also stock the full line of Sealy mattresses including Sealy Posturepedic, Sealy Optimum and Hybrid sets in every comfort level available. All in stock for immediate delivery. By selling all of our product directly off the showroom floor you can see exactly what you’re getting and normally have it delivered the same day. We also offer custom upholstery and leather options on all of our sofas, sectionals, chairs and recliners that can be delivered in about 4 weeks.